These are the worksheets that can be printed out to accompany the homeschool textbook "Exploring Life Science." The textbook will be published soon. The worksheets do not need to be used. The textbook identifies important things to write down. The worksheets are provided to make it easier and quicker for some students. The worksheets do require many sheets of paper, so I suggest printing them back to back. 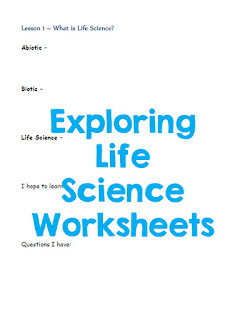 This is the link to a pdf of the "Exploring Life Science" worksheets. Thank you for writing the textbook and workbook. We are looking forward to using the set this year with my second-grader, who is very interested in science. He reads well and has so many questions that I figured we could start out slowly and see how everything goes. I certainly do not want to put him off of science at all, but I know that he would appreciate more structure than what we're currently doing. You're welcome! Have fun doing science with him! At his age, it's great to let him take the lead and see where his interests go. Enjoy. Even if this textbook is too much now, it might work later on for him. Just have fun doing science activities you can enjoy together.